Audio USB interfaces have numerous parameters and requirements that differ compared to older, legacy digital audio links, therefore our A.S.P. XPHYNX USB Cable has been entirely engineered from the ground-up with all-new components. Every detail of its unique design is focused on reaching the technical limits of signal transmission and protection, resulting in a virtual elimination of jitter, inconsistent code and timing errors. The use of an almost perfect (vacuum) dielectric in conjunction with electromagnetically optimal palladium alloy conductors creates a virtually magical synergy that other, more traditional USB cable designs simply cannot provide. Extreme levels of highly effective shielding and mechanical damping protect the fragile digital signal for optimal accuracy. Cryo-treatment of all signal-carrying elements (wire and connectors) pushes performance further, to unmatched levels. As with all other Stage III Reference cables, no commercially produced "off-the-shelf" components are employed in their construction. The A.S.P. 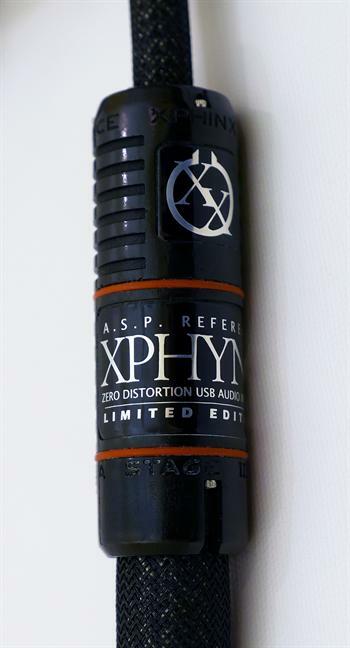 XPHYNX, a genuine leap beyond any other reference USB interface on the world market. A.S.P. REFERENCE XPHYNX USB digital cable employs Cryo-treated custom slow-extruded silver/palladium AeroStrand Ultra™ ribbon conductors in a quad-coaxial configuration, individually shielded conductors with silver braid return. Vacuum dielectric; Nylon and FEP Teflon inner core drawn to 675mmHG. H.D.A. 100% radiation invulnerable shield. • Cryo-treated, proprietary HYPERION, gold-contact USB connectors.